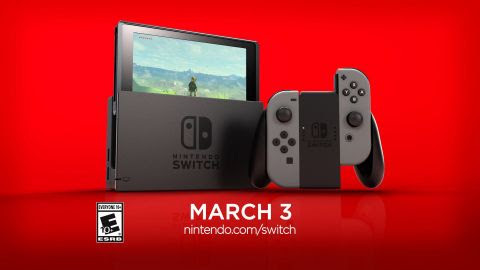 The launch of the Nintendo Switch system is rapidly approaching on March 3, and Nintendo can confirm that Nintendo eShop will be ready to go, complete with a lineup of downloadable indie games. To celebrate many of these upcoming "Nindie" creations before launch, Nintendo will host a Nindies Showcase video presentation on Tuesday, Feb. 28, at 9 a.m. PT. Just visit http://live.nintendo.com to watch. FAST RMX from Shin'en Multimedia: Challenge your friends to local split-screen competition or take part in online races against players from all over the world. This lightning-fast anti-gravity racer is exclusive to Nintendo Switch. Shovel Knight: Specter of Torment from Yacht Club Games: The latest DLC for the critically acclaimed hit Shovel Knight is a full-featured game starring Specter Knight, one of the enemies from the original game. The massive campaign includes even more content than the last DLC, Plague of Shadows. Shovel Knight: Specter of Torment is exclusive to Nintendo Switch for a limited time. Shovel Knight: Treasure Trove from Yacht Club Games: For Shovel Knight's biggest fans, Shovel Knight: Treasure Trove includes the original Shovel Knight game, as well as all previously released DLC - even Shovel Knight: Specter of Torment! Shovel Knight: Treasure Trove will be exclusive to Nintendo Switch for a limited time. People who already have funds in their accounts on other Nintendo devices can access them using a shared wallet that works on Nintendo Switch as well. Once they link their Nintendo Network ID and Nintendo Account and then their Nintendo Account to their Nintendo Switch system, this functionality becomes possible. Virtual Console games will not be available on Nintendo Switch at launch. We will share more information in the future. A news feature will offer updates about the latest additions to Nintendo eShop, as well as providing information about upcoming games and other updates from Nintendo. To access Nintendo eShop, a system update that will be available on launch day is required. The system update downloads in the background, is designed to install quickly and doesn't disrupt gameplay. After visiting Nintendo eShop on Nintendo Switch for the first time, gamers can also purchase Nintendo Switch digital games on Nintendo.com. Users can purchase the games on Nintendo's website and have them download automatically to their Nintendo Switch system at home or on the go, wherever there is a Wi-Fi connection. For more information about Nintendo Switch, visit http://www.nintendo.com/switch.